Who’s in the frame to be the next Cobblers manager? Chairman Kelvin Thomas is expecting to be inundated with applications for the manager’s job at the Cobblers following Chris Wilder’s departure. Thomas has stated he had already spoken with four potential candidates before it was confirmed Wilder had left for Sheffield United, and he is anticipating a rush of interest now the move has been made official. So who is in the frame to become the next manager of Northampton Town FC? And what sort of manager is going to be best for the job? Those in the frame? It always it is just a guessing game at the moment as Thomas will be sifting through those declaring their interest, and those currently at other clubs that he may feel will be the perfect fit. The bookies are setting the odds for who the new man will be, and they make former Blackburn Rovers boss Gary Bowyer the favourite at (6/4 with SkyBet). Next in the frame is Robert Page (4/1), who is currently boss at Cobblers’ Sky Bet League One rivals Port Vale, while there are then a clutch of managers priced at 12/1 with BetVictor. They are former Brentford, Rotherham and Aldershot boss Andy Scott, Exeter City manager Paul Tisdale, AFC Wimbledon boss Neil Ardley and Steve Cotterill, who is out of work after being sacked by Bristol City earlier this year. Also on the bookies’ speculative lists are the likes of Chris Powell (14/1), John Sheridan (41/1), Steve Clarke (14/1), James Beattie (14/1), Billy Davies (16/1), Mark Robins (16/1), Neal Redfearn (16/1), Paul Dickov (16/1) and Wycombe Wanderers manager Gareth Ainsworth (16/1). 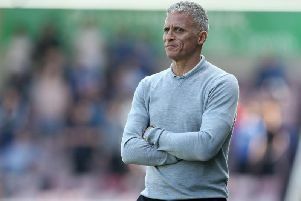 An interesting name in the frame is former Cobblers defender Ashley Westwood, who has enjoyed big success managing Bengaluru FC in India, but it really is all just guesswork at the minute as former Cobblers manager Gary Johnson is rated a 16/1 shot with BetVictor - and that will never happen. Another name that’s been linked is that of Chris Hargreaves, a former Cobblers midfielder who was interviewed by David Cardoza and was close to getting the job the last time it became available, being pipped to it by Wilder. Hargreaves also played for Oxford when Thomas was at the Kassam Stadium, and was manager at Torquay United when the Cobblers chairman was acting as a consultant to the Plainmoor club. So, what type of manager should Thomas be looking for? Well, that’s obviously down to Thomas and good luck to him in his search, but if it were me looking at bringing in a new man I would be wanting more of the same. A case of, if it ain’t broke, don’t fix it. It’s perhaps an obvious call and is easier said than done, but I would be looking to bring in a manager in the Chris Wilder mould, a manager that can work within budget, and can make the most of the players at his disposal. A manager that demands 100 per cent from every player, in every minute of every match, and day-to-day in training too, because for all of the ability in the Cobblers squad - and there is plenty - it is the work ethic that was behind their success. Looking at the Town squad, it doesn’t need any sort of major overhaul, far from it. It is definitely a case of evolution rather than revolution for any new manager, who should concentrate on simply adding to what is already there. Look at what Claudio Ranieri has achieved at Leicester City. He went to the Foxes last summer knowing they had showed some incredible form at the end of the previous season, so he just let them carry on that momentum, and added a couple of extra players and touches that saw them take the Premier League by storm. The new man at Sixfields, whoever it may be, could do the same. The players have just won league two by a country mile, are high on confidence, and are comfortable in the systems they are asked to play in, whether it be 4-4-2 or 4-2-3-1. They know their jobs inside out. Yes, extra quality has to be brought in as the club is stepping up a level, but with virtually all the key players already contracted, with the team an already well-oiled machine, changes only need to be of the minimal variety. Kelvin Thomas has said he would like to get a new man in place as quickly as possible, but also made it clear the whole recruitment process will be thorough and done professional ly. But speculation is going to be the name of the game for however long it takes Thomas and his fellow board members to reach their decision, and complete yet another unexpected chapter in this amazing story of a season. WHO would you like to be the new Cobblers manager? Let us know in the comments section below.